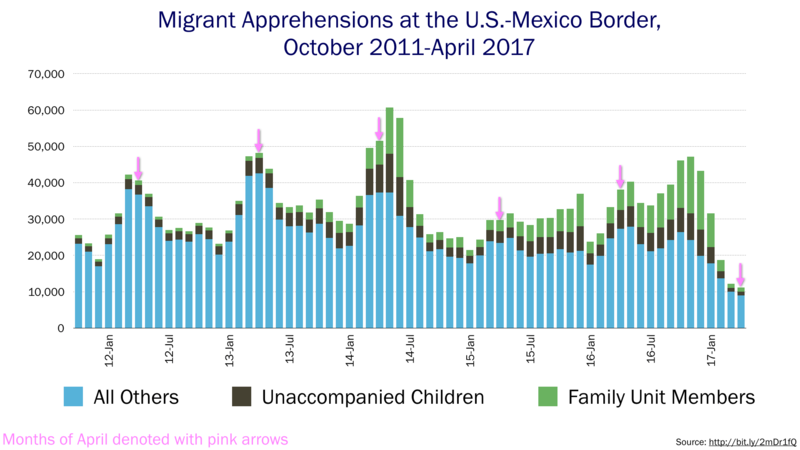 Border Patrol reported its April apprehensions of migrants at the U.S.-Mexico border last week, when I was traveling at the border. The 11,129 migrants apprehended last month broke February’s and March’s records for the fewest since Border Patrol started making monthly records available, in October 1999. But the 9 percent month-on-month decline was less steep, indicating a possible leveling off. All I can say is, don’t trust anyone who says they can predict what these numbers are going to look like in six months. My best guess is that they’ll rise to something between the April figure and the January figure—but I could be way off.